Cholesterol is a type of fat that is found in food from animal sources such as eggs, meat, dairy products, fish and shell fish. We have come to believe that cholesterol is a ‘baddy’, but, in fact, we need it to give our cell membranes a certain amount of stiffness, to manufacture hormones and cortisone, and create Vitamin D and the liver makes bile from cholesterol. However, we do not need to eat foods that contain cholesterol as the body is very good at making its own supply. There are two types of blood cholesterol. Low density lipoprotien (LDL), known as the ‘bad’ cholesterol, because it contributes to heart disease by sticking to and narrowing blood vessels. 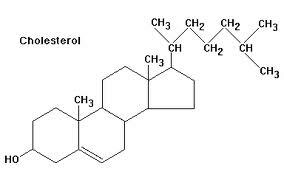 High density lipoprotien (HDL) is the ‘good’ cholesterol as it keeps LDL in check. Although your body makes cholesterol, once made, it cannot break it down, so it is very easy for an excess to occur. Cholesterol can only be removed from the body by the liver in the form of bile, which it pumps into the intestines. If there is not enough dietary fibre to carry it out of the body, then the bile, with the cholesterol, gets reabsorbed from the bowel back into the liver, not a cycle that is healthy for the body. The liver returns the cholesterol that cannot be used to the bloodstream where it can build up as fatty deposits. So how can we tell whether high cholesterol is a problem for us? Hard white spots around the eyes and skin flaps in the armpits may be indicators, but the only real way to check is to get a blood test done by your doctor. Increase your Omega 3 with flaxseed oil, oily deep ocean fish (do not fry), to improve cell membranes and cleanse the blood. Increase your exercise and drink plenty of water. Material sourced from Karina Francois, Naturopath, and ‘The Liver Cleansing Diet’ by Sandra Cabot.